In her powerful Art of the Party, party and beverage guru Kay Plunkett-Hoge provides a battery of upscale ideas to make your next party most memorable. Many people like lamb. Few of us eat it. Everyone would be a devotee if they sampled this recipe. These little lamb bites can be appetizers or be served in quantities for a main course. You’ll need French-trimmed lamb cutlets, so talk to your butcher. Good lamb, good lamb, has a delightful, fresh taste. This recipe calls for aioli and I’ve attached a recipe for homemade aioli from Bon Appétit. 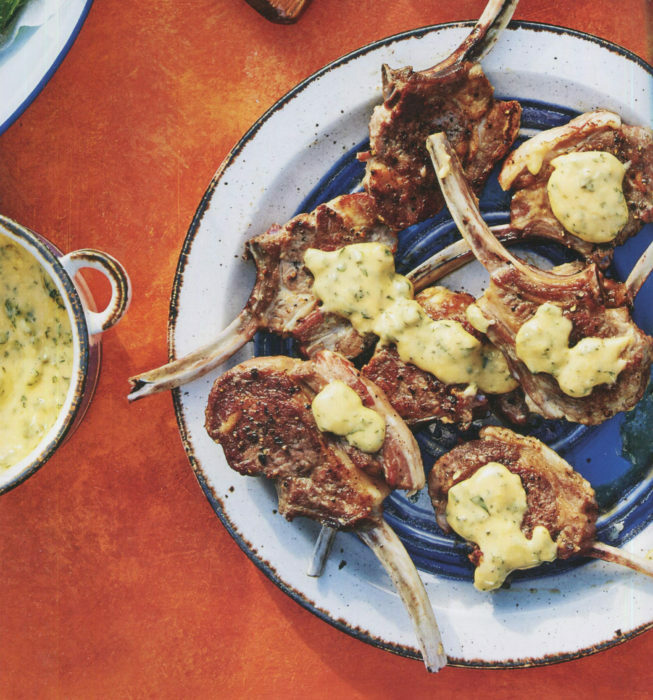 Rub the lamb cutlets on both sides with the halved garlic clove, then rub them with olive oil on both sides and season well with salt and pepper. Set aside. In a blender or food processor, blend the aioli with the mint and vinegar. Scrape into a bowl and stir in the capers. Heat a flat griddle pan or frying pan until very hot, then cook the lamb for about 2-3 minutes on each side until the cutlets are well browned but still nicely pink inside. Serve on a platter with some of the aioli drizzled over and the remainder on the side. Drape a kitchen towel over a small saucepan; set a small metal bowl over (this will hold bowl in place). Whisk egg yolk*, garlic, 1/4 tsp. salt, and 2 tsp. water in metal bowl to blend well. Whisking constantly, slowly drizzle in grapeseed oil, 1 teaspoonful at a time, until sauce is thickened and emulsified. Whisking constantly, add olive |oil in a slow, steady stream. Stir in cayenne; season aioli with lemon juice, pepper, and salt. *Raw egg is not recommended for infants, the elderly, pregnant women, people with weakened immune systems…or people who don’t like raw eggs. But they won’t have to forgo this aioli altogether. Just use pasteurized egg yolk instead.